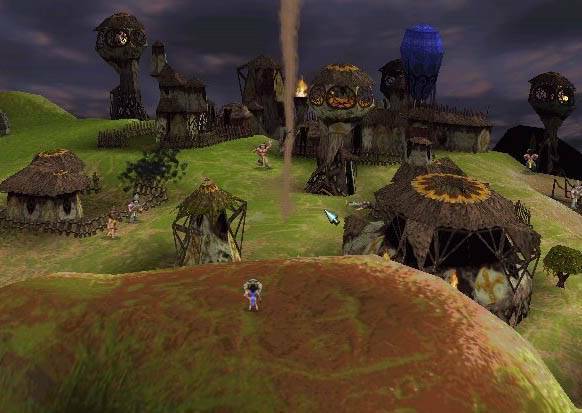 The Beginning allows the player to directly control the action of followers, by ordering them to build structures or attack enemies. In the campaign, the player must fight the opposing Dakini, Matak and Chumara tribes for dominion over the solar system. Enemy tribes also have shamans, and later levels have all three tribes on one world. Whilst the objective is always to eliminate all of the members of the other tribes, there are often specific ways this can be achieved — sometimes the player must use spells gained from worship at special 'artefacts', such as stone heads or "Vaults of Knowledge"; in other cases, the player only needs to overwhelm the enemies with superior numbers. The game has no formal resource management; new units are created automatically at houses, and training new warriors costs nothing except mana. Only wood from trees is required to build new structures. 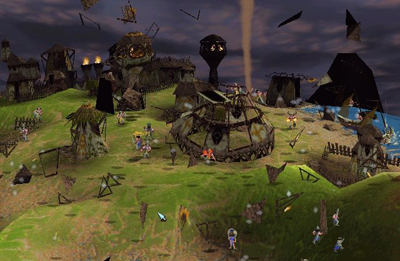 The game is played from a 3D third person perspective with the camera at a variable height and capable of rotating 360°, enabling the player to quickly move across the planet's terrain, which is actually a real projective plane rather than a usual sphere; on maps where there is no fog of war, players can see what opponents are doing at any time. Extensive support for 3D acceleration enables the player to view the game in 16-bit or 32-bit colour. The landscape and real-time structure building and follower movement are also shown. Download Latest patch applied , extract and play .